Color: They are most often grey in color. Characteristics: Moles are small, furry creatures with tiny eyes and ears and have atrophied hind legs with very powerful forelegs that are meant for digging vigorously in the ground. Moles can be found burrowing tunnels throughout North America including the Houston metro. Size: Their bodies range between 6 and 8 inches long and they weigh between 3 and 6 ounces. Moles favor soft soil that has an abundance of earthworms and other invertebrates on which they can feed. They eat a variety of nuts as well as grubs and other insects that may be found in your garden and around your landscape. What Kind Of Threat Do Moles Pose? Moles don’t directly pose a threat to the health of your family or your pets, but having them on your property can be quite damaging to your lawn and your landscaping. The tunnels they dig in the earth under your grass can weaken the surface of the earth, causing it to soften and feel spongy. Moles will burrow holes into the ground that leave little mounds of soil on your lawn and can affect the root system of the grass and other plants, leaving them yellow and dying. Having moles digging tunnels under your property can cost you a lot of money in landscaping repairs and can be really detrimental to the appearance of your property. 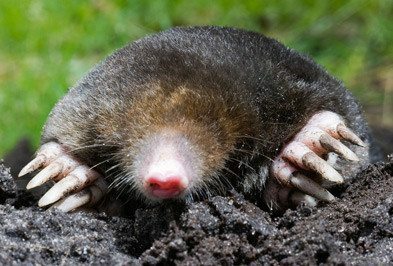 How Do I Control Moles? Do-it-yourself mole control rarely works and can often be more damaging to the landscape than to the mole population. Because correct mole control is a very complex process, it’s best to contact Texas pest control professionals when it comes to dealing with a mole problem. Holder’s Pest Solutions in Houston has the knowledge and the tools to get rid of moles on your property. If you have seen soil mounds on your lawn or ridges of soil that lead to underground tunnels, contact the professionals at Holder’s today to find out how our pest control services can help. When it is cold, rodents look to enter man-made structures. Rodents--known for their incisors that never stop growing--must chew to wear their teeth down. This natural propensity to gnaw allows them to chew their way through soft wood to gain access to wall voids, attic crawl spaces, and other areas in your home or garage.